*Tip - when mixing patterns, vary the size. For example, the rug below has a large pattern, the cheetah pillow has a medium pattern, and the coral pillow has a small pattern. And well the sheepskin has no pattern, just texture. 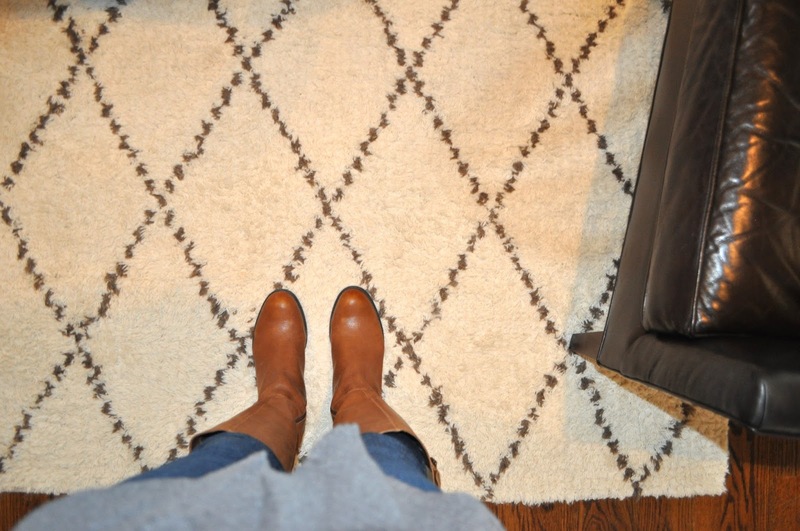 Even our beige entry rug has a tone on tone pattern. Here's my new chevron stool below. 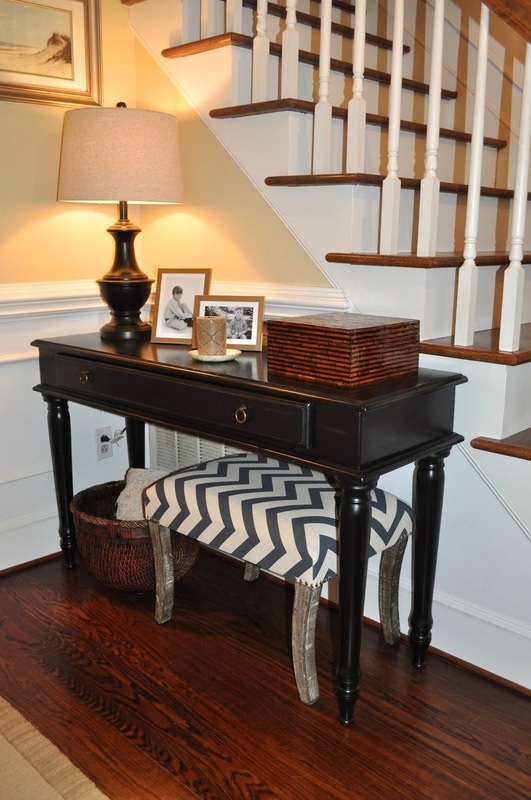 Our neutral entry desperately needed some color and pattern, so this was a great find! 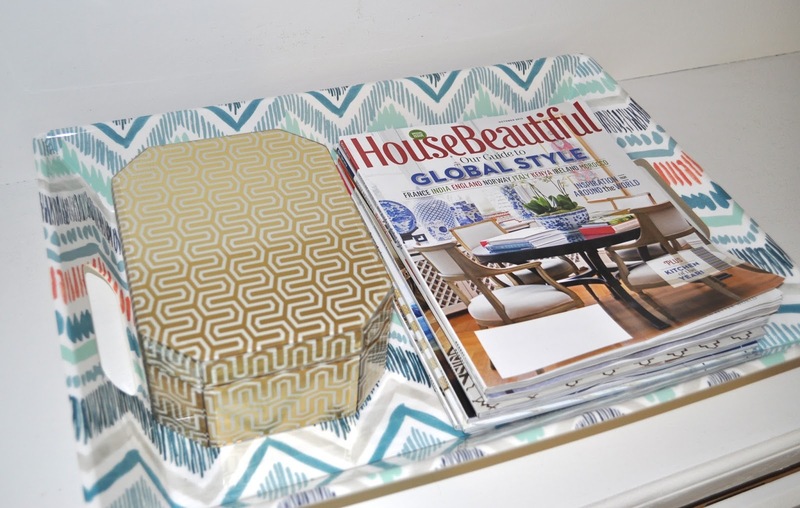 Finally when I added new accessories to our built-ins, I found this fun patterned tray at Target. With the grays, blues and even a little coral...the colors are perfect! I even found this gold patterned storage box on clearance. Really? It's like patterns are calling my name! Seriously though, mixing pattern and color are one of my favorite things about decorating. It just makes things interesting if you do it right, and your space will never be boring. Thank you! We got the rug at Home Goods for an unbelievable price. Yes, I say you totally should buy one, especially if your looking for more bold patterns in your home! So fun! Love all of the patterns and colors! Thanks Gabbi, it's may favorite part of decorating! Thanks Julia, and we love the rug too. And it's holding up well too considering we have two large dogs! I know Kathleen that's what we found! I was so surprised! Your new pattern mixing looks so great Jane. 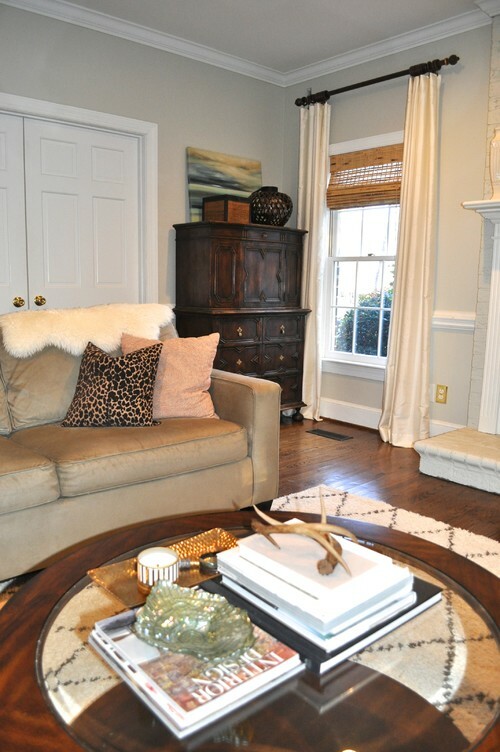 I love the combination of the leopard, coral and the blues that are already in your family room. I need some serious pattern mixing but I am the slowest to make decisions about my own house!!! Thanks Lisa, I'm slow too. But have to say once you start, each pattern get's easier to pick. They'll just jump out at you!